rethinking the desktop interface for productivity. The desktop computer hasn’t changed much in the last 30 years. It’s still built on windows, folders and mouse input. But we have changed. We now use smartphones and tablets most of the time, since they are much easier to use. 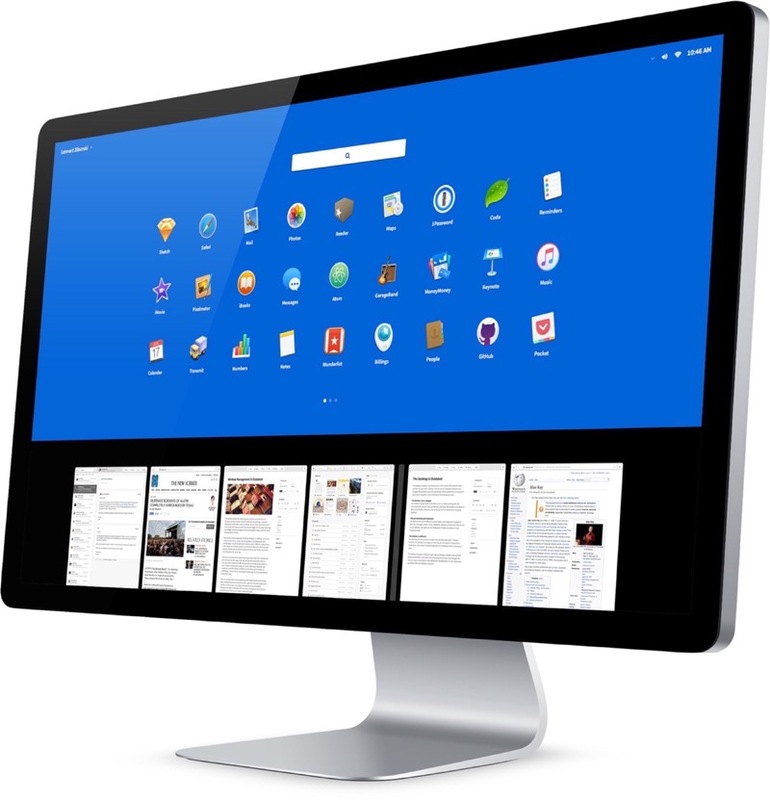 Neo is a conceptual desktop operating system interface that is built for todays people, needs and technologies. Visualized below are ideas that were designed to inspire and provoke discussions about the future of productive computing. I have no intention of taking this beyond the concept stage. However, I am putting my work out there hoping that people build upon it. Your whole screen for easy multitasking. Neo shows your apps as panels. They fill the full height of your screen and are placed next to each other without overlap. 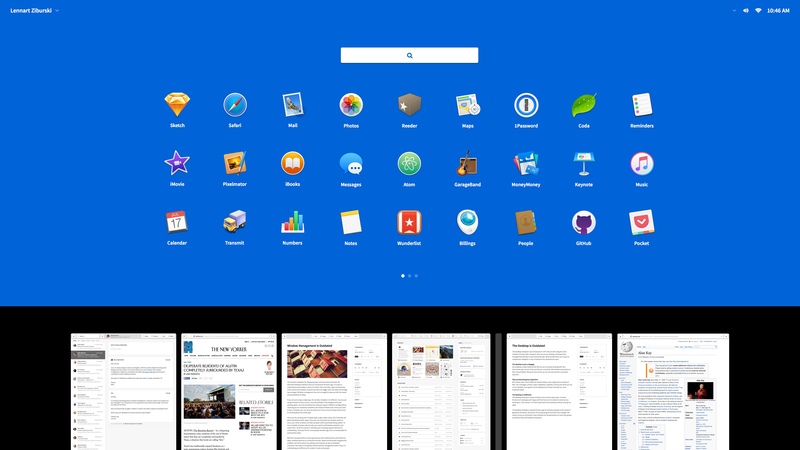 You can have dozens of panels open and easily scroll through them to switch between apps. 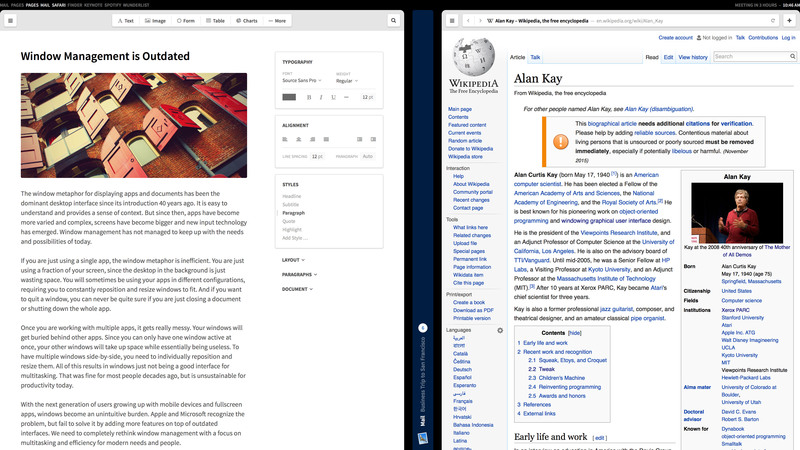 Or resize and move them to work with multiple apps side-by-side. Panels use screen space more efficiently and are a more elegant way to multitask than normal windows. Overlapping windows as an interface metaphor were invented over 40 years ago with the Xerox Star. Since then, the amount and complexity of how we use computers has increased dramatically. Windows are now inefficient and incompatible with modern productivity interfaces. 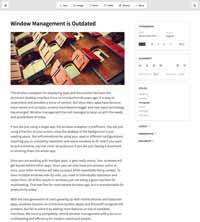 For more, read my blog post "Window Management is Outdated". For a similar concept, also check out Clayton Miller’s fantastic 10/GUI (2009). 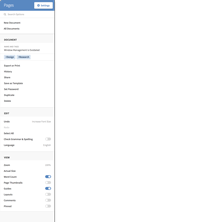 Resize a panel to fit within your screen by just clicking on its edge. Minimize panels to save space while still getting a peek at the app. Pin a panel to your screen to keep it on top while switching apps. One place for apps and panels. Drag down on the touchpad with three fingers to open App Control. Quickly access user, power and system settings. Launch, search and organize your apps. You can even drag an app icon to a specific panel position below to open it there. 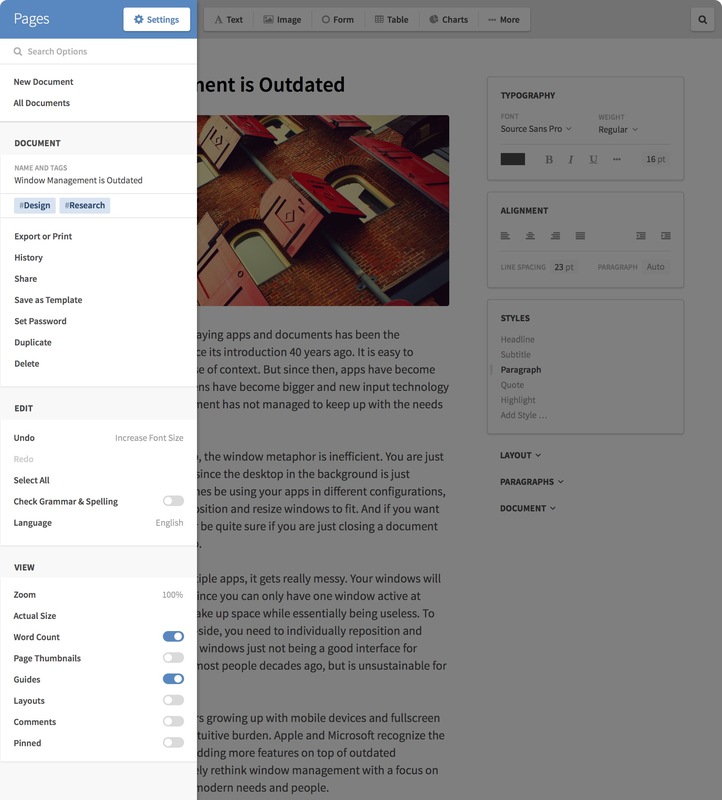 Get an overview of your open panels and resize, move or close them from here. The only menu you need. 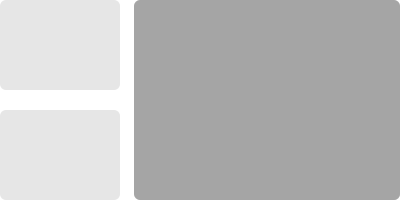 The average menu bar consists of dozens of items in arbitrary categories without regard for importance, redundancy and context. Neo makes it easy to find and access these options. Open an apps menu with a three-finger click on the touchpad, or press the menu button at the top left of each app. 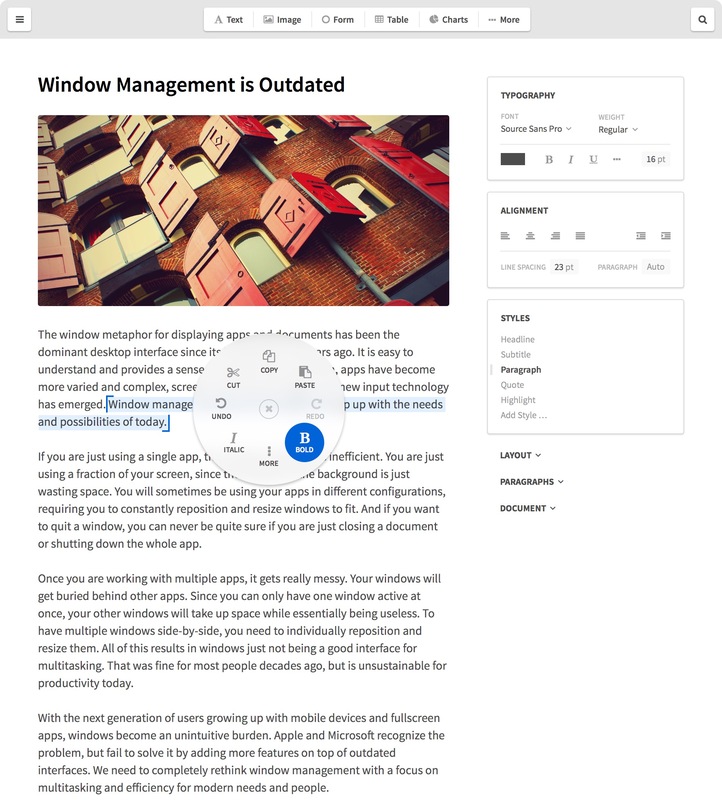 The app menu contains all relevant options for your app and its content, including naming and tagging your document. Contextual content options are not shown in the app menu. The list is easily scannable and you can search for options just by typing. Quick access to your content. The first thing you will see when starting Neo is a Finder panel. You can also click and drag up with three fingers on the touchpad to open one at anytime. 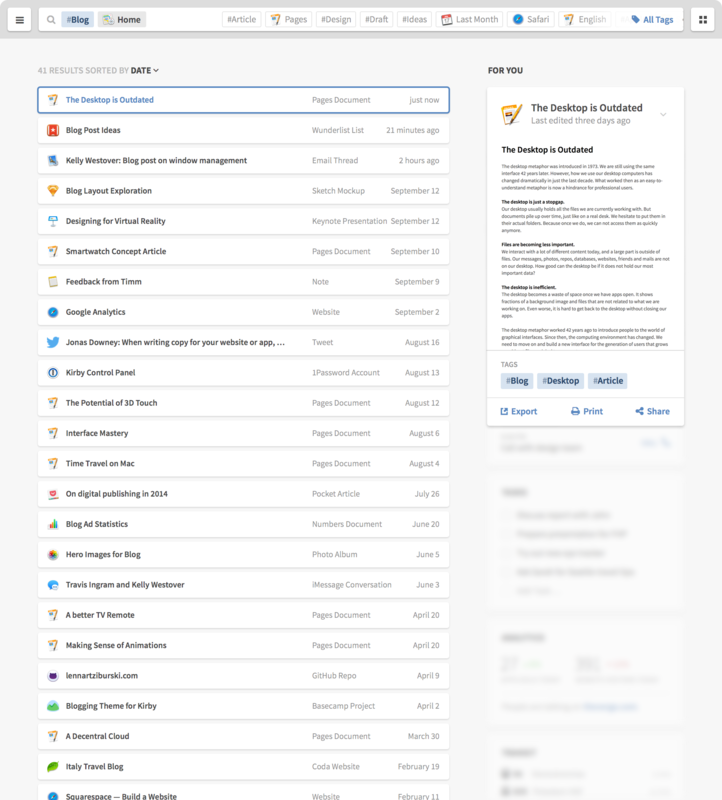 Finder gives you powerful and easy access to your content. What’s wrong with the desktop? 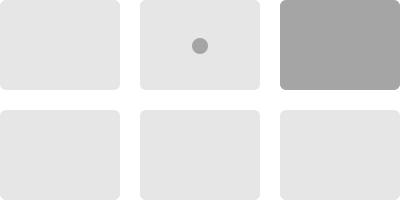 The desktop metaphor as the basis of computer interfaces is inefficient and outdated. Today, most of our data exists outsides of files and folders. The desktop worked great to get us started 40 years ago, but it was never built for the complexity and amount of work today. For more, read my blog post "The Desktop is Outdated". Find any tagged content or accessible data by searching with tags, filters and text. Favorite any kind of content or data for quick access. Relevant content based on what you are doing and past behaviour. Get an overview of relevant information from your apps, and from services like Google Now. Cards allow you to interact with what is important right now without ever opening an app. Children growing up now are using hashtags and Google long before files and folders. We know how to enter something into a searchbar and get relevant results. Even our brain works through association, not hierachy. Neo uses tags instead of folders to make finding all your content more flexible and efficient. You can tag everything from documents and apps to mails, websites, tweets, people or events. Tags could even expand to specific content on the web, like videos on YouTube or products on Amazon. So instead of your stuff spreading across many different apps and services, you can get all related content in one place. The location of content becomes irrelevant, making sharing across devices and users much easier. Tags are very flexible. You can add multiple tags, and you don’t have to define a specific location or a single hierachy. Of course, you can also edit tags later on. But you don’t need to use tags for everything. You can still use search, filters and document pickers from apps to get to your content. Tagging is a pro feature that can extend and coexist with more basic means of file management. Tags in Neo are styled as hashtags (like #tag). Hashtags brought tagging to a mainstream audience and are instantly recognizable. They are also very quick to add, without switching to a specific tagging mode. Folders were a great metaphor when our files were a handful of office documents. But today, complex hierachies make it hard to organize and find what we are looking for. The concept of a file being located in a single place seems outdated. Content is stored, synced, backed up and shared among many different devices. And our most important content lives in services or apps, not in folders and files. While mobile devices are trying to kill file management completely, it’s more important today than ever. With the enormous amount and complexity of content, we need a new solution. You can tag all kinds of content. At the top of the Finder is the search bar. Even before you enter anything, it suggests tags and filters based on recent apps, content and searches. Just click on one to start searching for it. You can enter normal text for search, or enter tags by writing a hash (#tag). Results appear below as you type. Additionally, the suggestions will auto-complete tags and filters, so you don’t have to be perfectly precise. And once you are done, you will get suggestions to further narrow down your search with related tags. Of course, you can also view a list of all existing tags and filters to get a complete overview. Filters are tags that are automatically added to your content by apps. You don’t have to manage them yourself. You can add filters to your search by just typing them out. Neo will then automatically suggest available filters, which you can add with one click. View and do without apps. Click on a search result to see its card. Content Cards show you a preview and information about the selected item without opening the app. They also let you quickly add tags to your content. You can even perform quick actions, like printing a document, messaging a friend or buying a product. In some cases, tags can be less efficient than folders. With folders, you could just open the clients folder and get a list of all its subfolders. Tags don’t have this kind of hierachy. Neo solves this by letting you apply tags to other tags. So you can add the tag #clients to #client1, #client2, and so on. Then search for #clients to see a list of all those tags / clients. From there, you could just click on a tag to see its content. Being able to tag a tag gives you the hierachy of folders when you need it, while still keeping the flexibility and ease-of-use of tags. Smart Tags let you automatically tag content based on rules. You can set rules through all other tags and filters. For example, the Smart Tag #iphone could be automatically added to all documents created with the app Sketch that are also tagged with #mockup and have a resolution of 1334x750. Then, you can just search for #iphone to find those files. 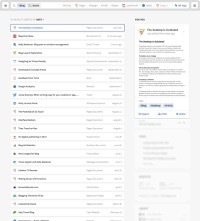 Smart Tags are an easy way to organize your content without going through every single file. Neo tracks your eye gaze, so you don’t have to point with a mouse cursor before clicking. Gaze tracking hardware has become a lot better, smaller and cheaper over the last few years. It can be built in alongside a webcam. However, gaze tracking is obviously still not as precise as traditional mouse input. We can work around that by using a touchpad as a secondary input. Whenever you put a finger on the touchpad, your current gaze selection is highlighted. If necessary, you can easily adjust the selection by moving your finger. Then just press down to click. This is comparable to the hover effect on the web. It’s much faster and easier than using a mouse, while still being precise enough for most tasks. What’s wrong with the mouse? We have been using a mouse as the main input for desktop computers for over 30 years. But during the last decade, smartphones and tablets have established new input methods. However, the transition of touch, gesture and voice input to the desktop has often been clunky and unintuitive. 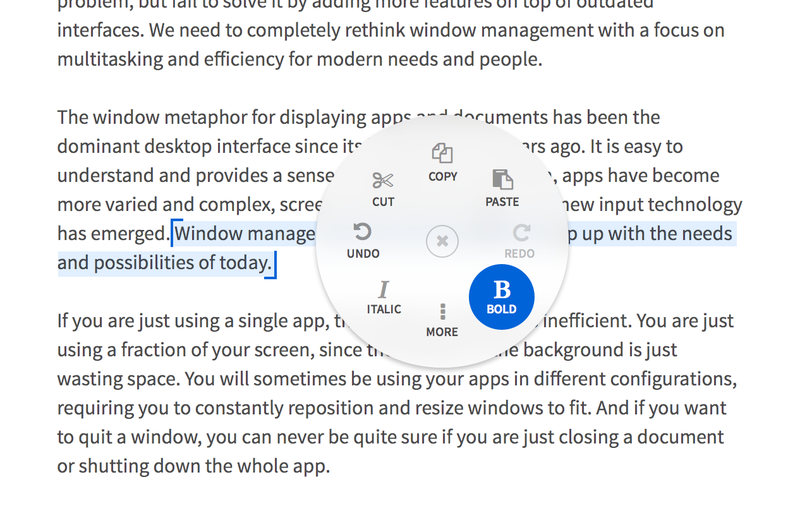 We need to use these new technologies to rethink the desktop interface and remove layers between users and tasks. We need interfaces that work well across devices and provide an easy transition from using smartphones. How does gaze tracking work? Eye trackers are small cameras combined with infrared lights. They create reflection patterns on your eye that the cameras capture. The image is then analyzed to track your gaze. You can learn more about eye tracking on tobiipro.com. Touch to select what you are looking at. Swipe to adjust your selection. Click to confirm your selection. When your eyes are focused on a single panel for more than a minute, other panels slowly fade into the background. They instantly pop back if you look at them. Just type while looking at an email to reply to it. Or type while looking at a search field to search. Neo knows the context of what you want to do without unnecessary interactions. Before you decide to click on something, your gaze usually focuses on it for a short moment. That’s often enough to start preloading content in the background and substantially improve load times. Every person has a unique eye movement pattern. Combined with other sensors, this can be used for identifying users and security. Neo automatically dismisses incoming notifications after you look at them. You don’t have to swipe them away. A large touchpad is the perfect partner for gaze input. You can use it to select, scroll, zoom and more wherever you are looking. And for really precise input, you could use devices like Apple Pencil on the touchpad. Use one finger to interact with whatever you are directly looking at. With two fingers, you can scroll or zoom inside a panel. And three fingers let you modify and switch between panels. 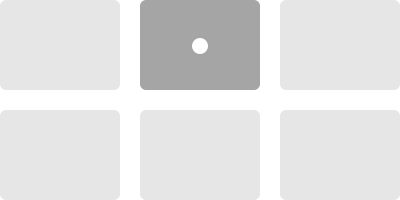 Place one finger on the touchpad to adjust a cursor at the gaze position. Use a second finger to set the end of the selection. Click harder (through Apples Force Touch) on an element to lift it up. Then click on its destination to drop it there. Click and hold on the touchpad with one finger to open the context menu wherever you are looking. Then swipe to select an action. This gives you quick access to common shortcuts with one smooth motion. 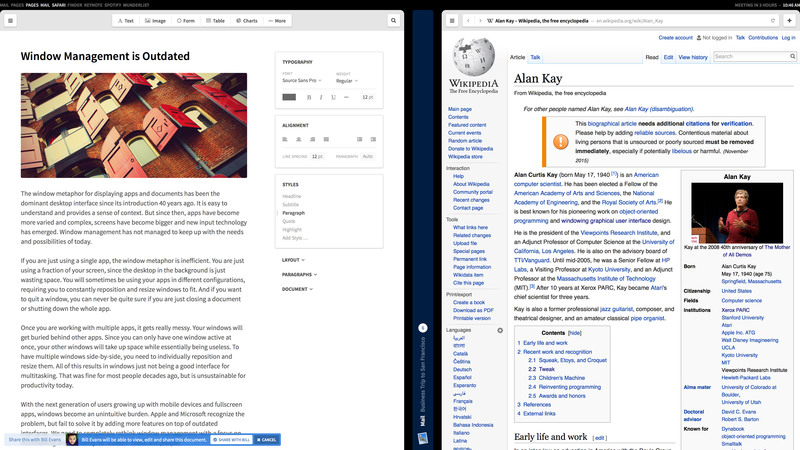 After a while, your muscle memory will learn to just click and swipe up on any element to copy it — without even looking at the menu. And if you ever need something that is not in the context menu, just swipe down to get a list of all available actions. This focus makes the context menu much easier and faster than the traditional right click menu. But it also lets you customize and master it over time to improve your efficiency. User learning and performance with marking menus. Hey Siri, get back to work! Voice input is a great fit for desktop interfaces. You are usually in a more personal and less noisy environment when working, and the tasks you do are more complex. That’s where voice input shines. With voice, you can access every possible command at any time – without going through a menu. You can reference elements that are not visible on screen and you can easily chain multiple commands together. And since Neo tracks your gaze, you can also reference what you are looking at. Just press the voice key on your keyboard and start talking. Neo shows results in the bottom left corner of your screen without disrupting your workflow. Voice input has much more potential than the basic virtual assistants on our phones. On the desktop, it should be focused on helping us do work, not on witty conversations that take over the whole screen. Apple also seems to be working on a powerful Siri for Mac. Read about it in this patent application. Neo rethinks desktop computing for productivity and efficiency. With panels, you can use your whole screen for easy multitasking and the new Finder is a quick way to the information you need. 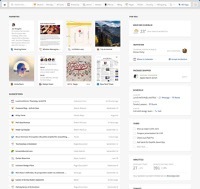 Tags, filters and content cards let you find and manage all your content without rigid folders. Gaze, touch and voice input enable easier and more efficient interactions, like the new context menu. I hope Neo helps you imagine the possibilites of a desktop interface designed for the people and needs of today. We need more people to think about the future of the desktop. So please do tell your friends about Neo, and share it on Twitter or Facebook. For more thoughts on the potential of desktop interfaces, definitely read "The Anti-Mac Interface" (1996) by Jakob Nielsen. Neo was designed to inspire and provoke discussions about the future of productive computing. It is not going to be a real working operating system interface, it is just a concept. I am not saying that these ideas would definitely work and that this is the future of computing. However, there is large potential in rethinking the core interfaces of desktop computing for modern needs, and somebody has to try. 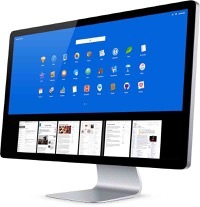 The process of designing Desktop Neo involved a lot of research, prototyping and iteration. I analyzed jobs-to-be-done, target groups and user flows. You can learn a bit more about the design process, previous iterations and the tools I used on the 'Design Process' page. Improving the ways we work with our computers is an important part of our future. Neo barely scratches the surface of the problems and possibilites that exist in this space. So I would love to see your ideas about the future of work computing. I am always happy to chat, so please do get in touch. I am also releasing this concept and source files under a CC license and am collecting open questions and interesting work on the 'Contribute' page. I am constantly sharing more thoughts and in-depth breakdowns of Desktop Neo on my blog. You can also follow me on twitter to stay updated. Desktop Neo sparked great discussions about the future of desktop computing on Hackernews, Designernews, The Verge and The Next Web. Lennart Ziburski designs interfaces to empower people. If you would like to write about Desktop Neo, please feel free to quote my writing. I have also put together a small folder with high-resolution images for you to use, as long as you attribute them back to me and this site. Of course, I would be happy to provide additional thoughts and answer your questions. Just send me an email. Thanks to Frank Rausch and Timm Kekeritz from Raureif and Prof. Matthias Krohn from FHP for their extensive support and feedback.